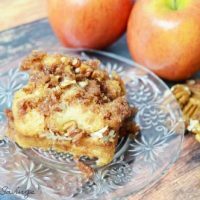 Cinnamon Apple Crumb cake is great for breakfast, brunch or dessert for Thanksgiving and Christmas! This is an easy to make moist apple cake. With this simple and easy dessert recipe, you will get lots of compliments. Looking for something a bit different to make with your apples this season? 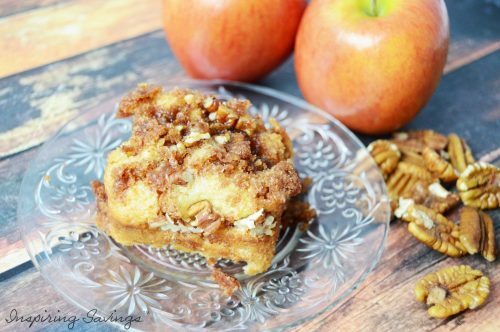 How about some trying these Mini Easy Apple Cinnamon Crumb Cakes. They are perfect for any type of weather. Plus, you can grab a napkin and take them on the go. 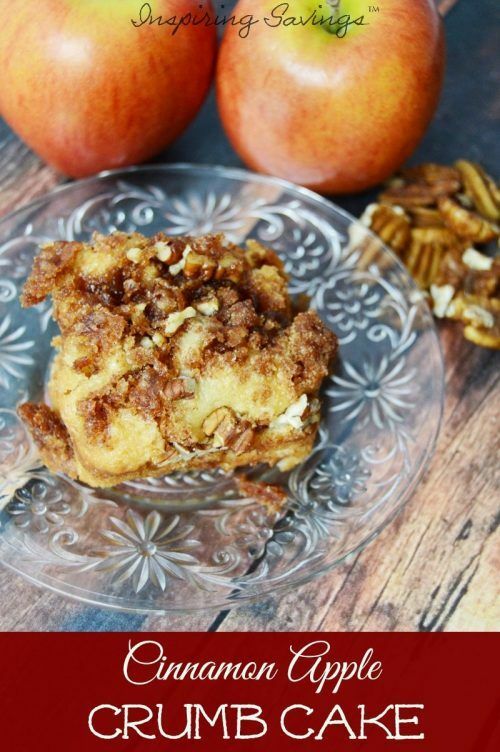 This recipe is based on my mom’s traditional Apple Cake recipe. I shortened the recipe by using Krusteaz Crumb Cake mix. After all, there are times when you just need a nice shortcut. I like to say this recipe is semi-homemade. We often don’t have the time to make a from-scratch recipe but want the taste. In New York State you can often choose from a bounty of different types of apples. I do love to cook with Empire apples. They add a tart, but sweet taste. Wink Wink, They are my secret to making a delicious apple pie. And there is no shortage of apples in these Crumb Cakes…FIVE to SIX whole apples! That’s nearly five cups of apples packed in there! First, you are going to start by peeling and coring all 5 – 6 medium apples into quarter size pieces place in a bowl with vanilla extract, brown sugar, and cinnamon then combined and set aside. I actually use a pretty handy apple corer. No matter the size of your apples you can always easily remove the core with this apple corer. Mix the Krusteaz Crumb Cake mix according to directions and add apples to mixture. Keep in mind that you do not want over mix the batter. The reason you do not want to over mix with this recipe is aeration. If too much air is incorporated your crumb cake will rise and then fall flat. Please do not think you need to gently mix or stand there shaking with your spoon thinking “am I overmixing”? Spend just a few minutes stirring all the ingredients in with a spoon making sure that all have been incorporated. That is it. I know some like to mix until the batter looks like and fluffy. This is the batter that gets you into trouble. Using a 6 ct large muffin or mini cake pan. When scooping the batter make sure you fill the muffin tin completely to the top as this batter does not rise much with the apples included. Using the leftover brown sugar from the cake mix kit and your (optional) pecans sprinkled on top prior to baking. Then Hellooooo, gorgeous! This cake is perfect for breakfast, brunch. dessert, fall gatherings or a holiday after dinner treat. It’s gorgeous and absolutely delicious! AND WHOA! Just think of adding in a scoop of ice cream on top of this freshly baked apple cake. Are you drooling? I sure am. Now it is time to get out the yoga pants. Granny Smith and Empire apples are my favorite types for any kind of baking, especially in dessert recipes, where the apple is really the star of the show. The tartness with the addition if the sugars play well together. Just ask my family about my apple pie? Delicious! I really do need to get that recipe up on the blog. For this recipe, however, you can really use any type of apple. It is a very forgiving apple recipe because the apples are chopped small, so just use whatever you have on hand. Peel and core all 5-6 apples into quarter size pieces place in a bowl with vanilla extract, brown sugar, and cinnamon then combined and set aside. Mix cake mix according to directions and add apples to mixture. Keep in mind that you do not want over mix the batter. Using a 6 ct large muffin or mini cake pan. When scooping the batter make sure you fill the muffin tin completely to the top as this batter does not rise much with the apples included. Using the leftover brown sugar from the cake mix kit and your (optional) pecans sprinkled on top prior to baking. Place in over to bake for 20 - 25 minutes until golden brown. Let cool.